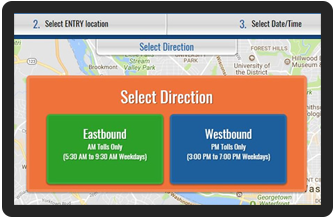 Click here to find current toll price estimates and past toll prices for any entrance or exit to the I-66 Express Lanes Inside the Beltway. Now, anyone is able to choose a faster trip during rush hours on Northern Virginia’s Interstate 66 Inside the Beltway, between Interstate 495 and Route 29 in Rosslyn. If driving alone, you’ll need to pay a toll and will need an E-ZPass. If you carpool, you can travel free and will need an E-ZPass Flex. Through dynamic tolling that keeps traffic free-flowing, you can have a quicker and more predictable trip on I-66 Inside the Beltway. If you are a solo driver, you can now use the lanes by paying a toll with an E-ZPass. If you have two or more people in your vehicle, you can continue to use the lanes free, but must have an E-ZPass Flex in the HOV mode. Use this website to find out when these new rules apply. If you travel on I-66 Inside the Beltway when tolling is in effect Monday through Friday, 5:30-9:30 a.m. eastbound, and 3 -7 p.m. westbound, you need to have an E-ZPass funded and properly mounted in your vehicle. If you are traveling with two or more people in your vehicle, you will need an E-ZPass Flex switched to HOV mode to travel free.